The Alaska Department of Transportation & Public Facilities is continuing to conduct safety assessments of state and public owned facilities in locations affected by the magnitude 7.0 earthquake that struck the state on Nov. 30. The agency said it has identified 123 facilities for assessment and as of a Dec. 5 update some 60 assessments are complete, with assessments on other critical state facilities are complete or are scheduled for completion in the next two days. Alaska DOT&PF also noted that it reopened Glenn Highway northbound and southbound lanes on Dec. 5 as well so “normal travel activities” can start to resume. The agency is also working with the Matanuska-Susitna Borough to restore and reopen Vine Road, which suffered “remarkable damage” during the earthquake. Alaska DOT&PF said it has assigned a construction manager to the project and is working with private contractor, Northern Asphalt Construction, to start repairs. The agency added that two main factors affect asphalt compaction: temperature and time. “Crews will take extra steps to accommodate for these factors,” it said in a statement. “Alaska’s contractors are experienced and they are dedicated to repairing the asphalt surfaces damaged by the earthquake. The agency – which oversees 239 airports, 10 ferries serving 35 communities, more than 5,600 miles of highway and 731 public facilities – inspected 243 bridges in earthquake-affected areas, including state and local bridges, but so far, no structural damage has been found. Alaska DOT&PF also underwent a leadership change during its earthquake recovery effort as John MacKinnon became the agency’s new commissioner on Dec. 3 following the swearing-in of Gov. Mike Dunleavy (R). 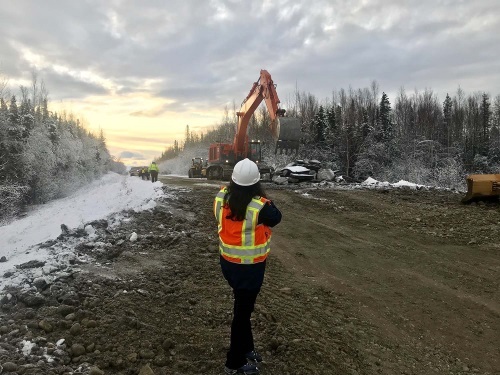 The Federal Highway Administration also provided $5 million in “quick release” emergency funds to Alaska DOT&PF on Dec. 1 to pay for the repairs made to restore essential traffic and prevent additional damage at emergency repair locations in Anchorage and surrounding areas. “The earthquake devastated roads and bridges across south-central Alaska, and these emergency funds will help reopen important sections of road more quickly to speed the overall recovery,” noted USDOT Secretary Elaine Chao in a statement. She added that such“quick release” funds are considered a “down payment” on the costs of short-term repairs while the state continues damage assessments for long-term repairs for highways and bridges impacted by natural disasters or catastrophic events.